Iran provides funding, training, weapons, rockets, and other material support to terrorist groups in Lebanon, the Palestinian Territories, and elsewhere. Elements of the Iranian national security apparatus are actively supporting the insurgency in Iraq. Iran's August 22, 2006 letter expressing its willingness to enter into "serious negotiations" on its nuclear program presents significant challenges for U.S. policymakers who must assess Iranian intentions, the likelihood that it would abide by a new diplomatic agreement, and whether Iran would exploit a new agreement to advance its nuclear weapons program. The U.S. Intelligence Community will play an important role in helping policymakers evaluate these questions. 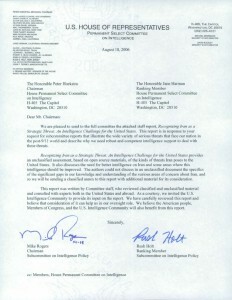 U.S. intelligence agencies will have to devote resources to verify adherence to whatever result negotiations might produce - Iran's compliance with any agreement that may be reached, or the international community's compliance with any new trade sanctions the international community may place on Iran should efforts to use negotiations to resolve the crisis fail. Accurate and comprehensive intelligence is critical for the development of good policy. There is a great deal about Iran that we do not know. It would be irresponsible to list the specific intelligence gaps in an unclassified paper, as identifying our specific shortcomings would provide critical insights to the Iranian government. Suffice it to say, however, that the United States lacks critical information needed for analysts to make many of their judgments with confidence about Iran and there are many significant information gaps. A special concern is major gaps in our knowledge of Iranian nuclear, biological, and chemical programs. US policymakers and intelligence officials believe, without exception, that the United States must collect more and better intelligence on a wide range of Iranian issues -its political dynamics, economic health, support for terrorism, the nature of its involvement in Iraq, the status of its nuclear, biological, and chemical weapons efforts, and many more topics of interest. The national security community must dedicate the personnel and resources necessary to better assess Iran's plans, capabilities and intentions, and the Director of National Intelligence (DNI) must identify, establish, and report on intelligence goals and performance metrics to measure progress on critical fronts. This report provides an unclassified assessment of the Iran question to help the American public understand the seriousness of the Iranian threat and to discuss ways U.S. intelligence collection and analysis against Iran must be improved. Iran poses a threat to the United States and its allies due to its sponsorship of terror, probable pursuit of weapons of mass destruction, and support for the insurgency in Iraq. 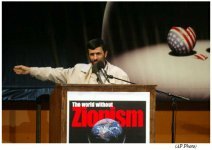 The profile of the Iranian threat has increased over the last year due to the election of President Mahmoud Ahmadinejad, who has made public threats against the United States and Israel, the continuation of Iranian nuclear weapons research, and the recent attacks by Hezbollah, an Iranian terrorist proxy, against Israel. Iran has provided Hezbollah with financial support and weapons, including the thousands of rockets Hezbollah fired against Israel in July and August 2006. Iran thus bears significant responsibility for the recent violence in Israel and Lebanon. Iran's efforts since December 2005 to resume enrichment of uranium, in defiance of the international community, Tehran's willingness to endure international condemnation, isolation, and economic disruptions in order to carry out nuclear activities covertly indicates Iran is developing nuclear weapons. It is worth noting, however, that some outside experts hold another view and believe that senior Iranian leaders are divided on whether to proceed with a nuclear weapons program, and contend that some Iranian officials argue that Iran should pursue nuclear research within the guidelines of the Nuclear Non-Proliferation Treaty (NPT) so Iran can maintain international trade links.10 These outside experts hold that until the leadership's intentions and decisions are known, it is difficult to assert with confidence that Iran is actually pursuing nuclear weapons. A nuclear-armed Iran would likely embolden the leadership in Tehran to advance its aggressive ambitions in and outside of the region, both directly and through the terrorists it supports - ambitions that gravely threaten stability and the security of U.S. friends and allies. An Iranian leadership which believes a nuclear arsenal protects it from retaliation may be more likely to use force against U.S. forces and allies in the region, the greater Middle East, Europe, and Asia. Nuclear weapons could thus lower the threshold for Iran's use of conventional force. A nuclear-armed Iran would likely exacerbate regional tensions. Israel would find it hard to live with a nuclear armed Iran and could take military action against Iranian nuclear facilities. A deliberate or miscalculated attack by one state on the other could result in retaliation, regional unrest, and an increase in terrorist attacks. Two decades ago, Iran embarked on a secret program to acquire the capability to produce weapons - grade nuclear material. Iran has developed an extensive infrastructure, from laboratories to industrial facilities, to support its research for nuclear weapons. Producing fissile material is a complicated process and Tehran faces several key obstacles to acquiring a nuclear capability: its inability to produce or purchase fissile material, the challenges of marrying a nuclear warhead to a missile, and the difficulty of adjusting its existing missiles to carry a nuclear payload. The principal method Iran is pursuing at this time to produce fissile material for nuclear weapons is a process known as uranium enrichment. This method involves spinning gaseous uranium hexafluoride (UF6) in large numbers of centrifuge machines to increase the fraction of uranium-235 (U-235), the uranium isotope that can be used as weapons fuel. Naturally occurring uranium contains only a very small fraction of this isotope (0.71%), thus the need for enrichment process. Weapons-grade uranium contains about 90% U-235. The IAEA has also uncovered evidence that Iran has pursued another route for nuclear weapons by producing plutonium. Plutonium can be separated from irradiated nuclear material such as "spent" fuel rods from a nuclear power reactor. North Korea is believed to have produced plutonium for nuclear weapons by separating plutonium from spent fuel rods. On June 6, 2006, Iran was presented with an incentives package backed by the United States, Russia, UK, France, and China to convince it to suspend its uranium enrichment program and begin negotiations with the EU-3 and the United States. After Iran refused to provide a clear answer as to whether or when it would respond to the offer, the UN Security Council passed Resolution 1696 on July 31, 2006 giving Iran until August 31, 2006 to fully implement a suspension of its uranium enrichment program as mandated by the IAEA Board of Governors resolution of February 4, 2006. If Iran does not comply by this date, Resolution 1696 states the Security Council's intention to take "additional measures" to compel Iran to comply. The United States is prepared to propose trade sanctions against Iran as the "additional measures. "15 Iranian President Ahmadinedjad rejected Resolution 1696 on August 1, 2006, indicating that his country would not be pressured into stopping its nuclear program and stating "if some think they can still speak with threatening language to the Iranian nation, they must know that they are badly mistaken." Iran responded to the incentives package on August 22, 2006, claiming it had provided a "new formula" to resolve the dispute and was ready to enter into "serious negotiations." The details of this response were not available when this report went to press. The recent attempt by the United States, the United Kingdom, France, and Germany to begin a new round of negotiations with Iran on ending its nuclear weapons program raise a number of difficult issues. U.S. policymakers must carefully evaluate Iran's August 22, 2006 response to the incentives package, Iranian intentions, and past behavior to make a judgment as to whether Tehran would abide by a new agreement curtailing its nuclear weapons program or would attempt to exploit a new agreement to advance its weapons program, such as by harvesting plutonium from new light water reactors an agreement might provide to Iran or continuing nuclear weapons research using the small uranium enrichment capability that EU-3 states are proposing to permit Iran to retain as part of an agreement. This evaluation will determine our participation in any negotiations and whether America could ultimately agree to be a party to a diplomatic agreement with Iran. A determination also needs to be made as to whether Iran's August 22, 2006 response addresses the requirements of UN Security Council Resolution 1696 - which requires Iran to suspend its uranium enrichment program - and whether additional action by the Council, such as trade sanctions against Iran, are warranted. We expect the U.S. Intelligence Community would play an important role in assisting U.S. policymakers with these questions - including whether Iran can be trusted to abide by a diplomatic agreement - and to assess the effectiveness and implementation of trade sanctions against Iran that could be employed if diplomatic efforts fail. In February 2004, Iran admitted to obtaining uranium centrifuge technology on the black market shortly after Dr. A.Q. Khan, the father of Pakistan's nuclear weapons program, confessed to secretly providing this technology to Iran, Libya, and North Korea.18 Khan also sold nuclear bomb plans to Libya.19 It is not known whether Khan sold nuclear weapon plans to Iran. The IAEA has discovered documentation in Iran for casting and machining enriched uranium hemispheres, which are directly relevant to production of nuclear weapons components.23 The IAEA is also pursuing information on nuclear-related high-explosive tests24 and the design of a delivery system,25 both of which point to a military rather than peaceful purpose of the Iranian nuclear program. The U.S. Intelligence Community believes Iran could have a nuclear weapon sometime in the beginning to the middle of the next decade. 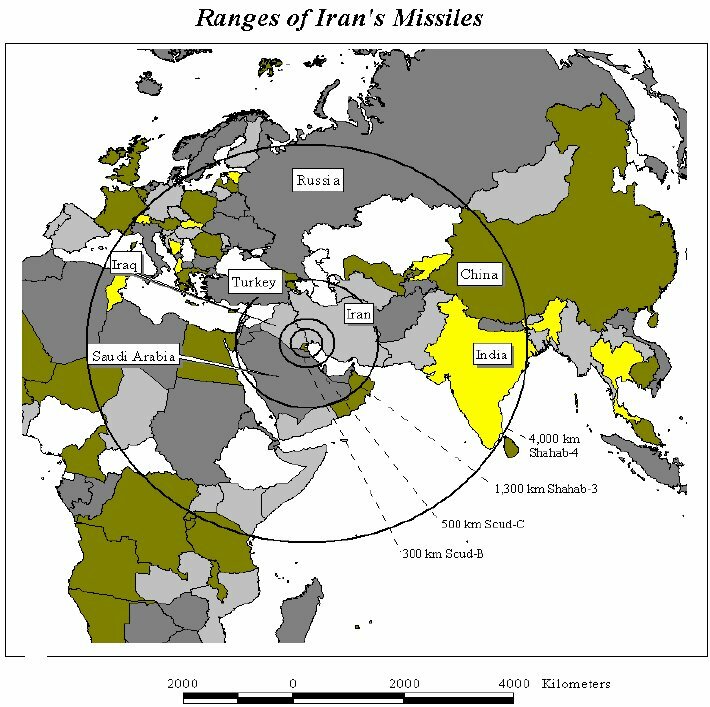 The timetable for an Iranian program depends on a wide range of factors - such as the acquisition of key components and materials, successful testing, outside assistance (if any), and the impact of domestic and international political pressures. It also depends on the assumption that Iran will overcome technical hurdles to master the technology at some point and that its leaders will not be deterred from developing nuclear weapons in the interim. P-2 centrifuges. "P-2" centrifuges could produce fissile fuel four times faster that "P-1" centrifuges. Iranian President Ahmadinejad announced on April 13, 2006 that that Iran "presently is conducting research" on P-2 centrifuges, a more advanced Pakistani technology. Iran admitted in January 2004 that it obtained plans for P-2 centrifuges from "a foreign intermediary" in 1994, but denied it had constructed any P-2 machines.31 Since that time, Iran has resisted providing details of its P-2 program to IAEA inspectors, who have only been allowed to observe the more basic P-1 centrifuges.32 A.Q. Khan provided P-2 centrifuges to the Libyan nuclear weapons program and could have provided this technology to Iran. Spent fuel from light water reactors. Extracting plutonium from a light water reactor's (LWR) spent fuel rods would produce weapons-grade fuel in less time than spinning unenriched UF6 in centrifuges. Spent fuel from the LWR Russia is building for Iran in the city of Bushehr could produce enough weapons-grade plutonium for 30 weapons per year if the fuel rods were diverted and reprocessed.33 Spent fuel from the LWRs that EU-3 states are proposing to give Iran as part of a new diplomatic agreement probably could be used to produce a similar amount of plutonium. While Russia has agreed to take back spent fuel from the Bushehr plant and store them in Russia, and although the fuel for reactors proposed by the Europeans should be placed under very strong international safeguards, Iran's record of non-cooperation with the IAEA and its years of secret nuclear experiments raise questions as to whether Iran can be trusted to honor an agreement on the disposition of spent fuel rods. Iran has engaged in an extensive campaign to conceal from the IAEA and the world the true nature of its nuclear program. Iran claims that its nuclear program is peaceful and for civilian electricity. While there are differences among some experts as to whether Iran may have an interest in a civilian nuclear program in addition to a weapons program, recent findings by the Department of Energy make a convincing case that that the Iranian nuclear program is inconsistent with the Iranian Government's stated purpose of developing civil nuclear power in order to achieve energy independence.34 Iran's claims that its nuclear program is peaceful also is belied by its record of non-cooperation with the IAEA, its decision to pursue nuclear technology covertly, and the fact that Iran does not have enough indigenous uranium resources to fuel even one power-generating reactor over its lifetime,35 although it does have enough uranium to make several nuclear bombs. Aside from Iran's lack of uranium deposits, Iran's claim that its nuclear program is for electricity production appears doubtful in light of its large oil and natural gas reserves. 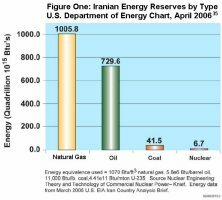 Iran's natural gas reserves are the second largest in the world and the energy industry estimates that Iran flares enough natural gas annually to generate electricity equivalent to the output of four Bushehr reactors. 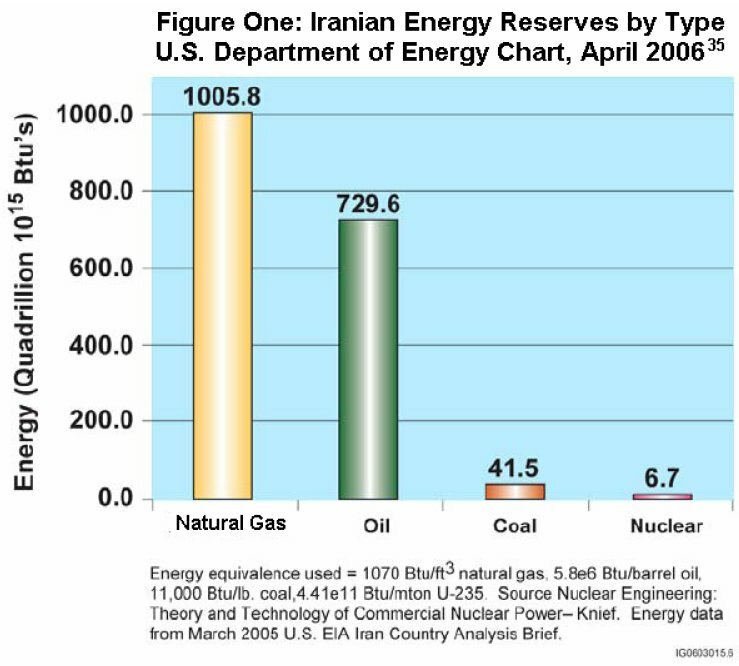 Iran's energy reserves are compared in Figure One. Furthermore, there is no rational reason for Iran to pursue a peaceful nuclear program in secret and risk international sanctions when the International Atomic Energy Agency encourages and assists peaceful nuclear programs. If Iran sincerely wanted a peaceful nuclear program, the IAEA would have helped it develop one provided that Tehran agreed to IAEA supervision and monitoring. Although it is likely that Iran is pursuing nuclear weapons, there is the possibility that Iran could be engaged in a denial and deception campaign to exaggerate progress on its nuclear program such as Saddam Hussein apparently did concerning his WMD programs. U.S. leaders need more definitive intelligence to judge the status of the Iranian nuclear program and whether there have been any related deception efforts. "We continue to believe that Iran has not acknowledged the full extent of its chemical weapons program, that it has indigenously produced several first-generation CW agents (blood, blister, and choking agents), and that it has the capability to produce traditional nerve agents. However, the size and composition of any Iranian stockpile is not known." "The Iranian BW program has been embedded within Iran's extensive biotechnology and pharmaceutical industries so as to obscure its activities. The Iranian military has used medical, education, and scientific research organizations for many aspects of BW-related agent procurement, research, and development. Iran has also failed to submit the data declarations called for in the Biological Weapons Convention Confidence Building Measures." IAEA Director General ElBaradei also raised the specter of Iran adapting its missiles to transport nuclear warheads when he wrote in a February 2006 report that the IAEA had asked Iran to meet to discuss "tests related to high explosives and the design of a missile re-entry vehicle, all of which could involve nuclear material." ElBaradei reported that Iran refused to discuss its alleged missile re-entry vehicle with the IAEA.49 These and other recent reported developments about Iran's ballistic missile program are alarming and pose a serious threat to America's allies, especially in the Middle East. Although Iran, being a denied area with active denial and deception efforts, is a difficult target for intelligence analysis and collection, it is imperative that the U.S. Intelligence Community devote significant resources against this vital threat. Detection and prevention are the two most important intelligence challenges concerning Iran's WMD and ballistic missile programs. The U.S. Intelligence Community needs to improve its analysis and collection on the problem of detecting and characterizing Iran's WMD programs. This is particularly important regarding Iran's nuclear program, where U.S. efforts to reach a diplomatic agreement are at a critical and sensitive point. The IC's ability to provide accurate and timely intelligence on a number of facets of Iran's program will be equally critical whether there is a negotiated solution to the current nuclear impasse or if sanctions are imposed. Improving intelligence collection and analysis to better understand and counter Iranian influence and intentions is vital to our national security. The Intelligence Community lacks the ability to acquire essential information necessary to make judgments on these essential topics, which have been recognized as essential to U.S. national security for many, many years. An important dimension of the detection of Iran's WMD program is how intelligence analysts use intelligence to characterize these programs in their analysis. Intelligence Community managers and analysts must provide their best analytic judgments about Iranian WMD programs and not shy away from provocative conclusions or bury disagreements in consensus assessments. It is vital that the Intelligence Community also provide intelligence the United States can use to prevent Iran from acquiring WMD technology and materials. This is a global challenge and the U.S. Intelligence Community must be prepared to play an important role as the Administration seeks the cooperation of like-minded government officials in efforts to prevent Iran from acquiring WMD or discouraging the Iranian regime and people from continuing to pursue such programs. The U.S. Intelligence Community, the Department of State, and the Department of Defense have reported that Iran provides training, funds, and weapons to a variety of Shia militias in Iraq which have been linked to assassinations, human rights abuses, and the planting of improvised explosive devices (IEDs) designed to maim and kill U.S. troops.57 The full extent of Iranian support to these militias is unknown, but three groups in particular have received Iranian support. Badr Brigade: The 20,000 strong Badr Brigade (recently renamed the Badr Organization to symbolize a transformation to a political organization) is widely believed by experts inside and outside of the US Government to be controlled by the Iranian-supported Supreme Council for the Islamic Revolution in Iraq (SCIRI). Its has been accused of running "death squads" that kidnap, torture, and kill Sunnis, including the 173 Sunnis found in a secret prison in a Ministry of Interior building in Jadriyah in November 2005.58 General George Casey, the U.S. military commander in Iraq, said on December 12, 2005 that the Badr Brigade openly placed its personnel in security units in the Iraqi internal security forces, and that the loyalty of these forces remains primarily to the militia, not the national security forces.59 Given the degree of Iranian influence over the group, the Badr Organization is widely seen as a means through which Iran has "taken over many of the Iraqi Interior Ministry's intelligence activities and infiltrated its elite commando units," to the point that "the Interior Ministry had become what amounted to an Iranian fifth column inside the U.S.-backed Iraqi government. "60 The organization is also believed to help Iran move agents, weapons, and materiel into Iraq.61 If Iran indeed has such influence inside the Ministry of Interior, it will have great insights into the Iraqi police force's strategies, plans and possibly even operations, thus giving Iran opportunities to defeat Iraqi efforts to undermine Shia extremists in Iraq. While there appears to be clear evidence that Iraqi insurgent groups receive assistance from entities in Iran, however, Joint Chiefs Chairman General Peter Pace asserted that he has seen no evidence Iran's government is the driving force behind such activity.66 Better intelligence collection and analysis is needed to determine the nature and extent of Iranian ties to Iraqi insurgent groups. The United States needs a range of information to adequately assess Iran's intentions and activities in Iraq. The U.S. needs to understand better Tehran's ongoing support to Shia militants conducting lethal attacks in Iraq in order to save Coalition lives and ensure the future of a stable, democratic Iraqi government. Insights into Tehran's efforts to exert long-term influence over Iraqi institutions will be important as well. Iran's links are strongest to Lebanese Hezbollah and Palestinian rejectionist groups, both of which have been designated by the United States as foreign terrorist organizations. Tehran is reported to have links to al-Qaeda, though U.S. intelligence information is insufficient to make a conclusive judgment on this relationship. Iran's influence over Hezbollah gives it a role in the Israeli-Palestinian peace process, making Tehran a player on an issue of global importance. Its ties to Hezbollah also provide Iran with a power projection tool -- "an extension of their state," according to State Department Counterterrorism Coordinator Henry Crumpton -- allowing it to authorize (or prevent) terror attacks as a way to exercise influence in the region or beyond.69 Iran also employs the threat of stepped-up terror attacks as a deterrent against hostile powers; the possibility that Iran might unleash its terrorist proxies against the United States and its allies undoubtedly gives pause to those who might call for aggressive action against Iran. The extent to which Iran directed the July/August 2006 Hezbollah attacks against Israel is unknown, as are possible Iranian objectives for provoking hostilities with Israel at this point in time. Certainly, Iran could benefit if the international community's attention was diverted away from Iran's nuclear program. It is urgent that the U.S. Intelligence Community redouble its efforts to uncover any Iranian agenda behind the attacks and learn how Iran may be directing them. HAMAS: While Iran has provided funding to HAMAS in the past, Tehran has increased its promise of support since the beginning of 2006. After HAMAS won Palestinian legislative elections in January, leading Western governments to cut off aid to the PA government, Iran has pledged to provide $250 million in financial support and urged other Muslim countries to do so as well.77 It is not clear, however, whether Iran (or other countries) will actually provide such funding. Popular Front for the Liberation of Palestine-General Command (PFLP-GC): The PFLP-GC was the first Palestinian group to receive funding from Iran, in 1989. Its guerrillas launched numerous attacks against Israel in the 1980s and 1990s and has served in recent years as a leading conduit through which Iran provided weapons and materiel to HAMAS and PIJ. It is unclear whether and to what extent Iran may have ties to al-Qaeda. The primarily Sunni Arab terrorist group is an unlikely partner for the overwhelmingly Shia Persian nation; its leader, Osama bin Laden, recently referred to Shia in Iraq as "rejectionist," "traitors" and "agents of the Americans. "80 Bin Laden's primary lieutenant in Iraq, the recently killed Abu Musab al-Zarqawi, declared a Sunni jihad against Iraqi Shia, targeting the community that hosts Iran's primary allies and proxies in Iraq. The United States needs a range of information to adequately assess Iran's sponsorship of terror. Current events in Lebanon highlight the danger Iranian support for terrorist proxies, such as Hezbollah, poses for peace in the region and underscores the need for timely and accurate intelligence on a wide range of issues related to Iran, Hezbollah, and other groups that enjoy Iranian support. Iran's relationship with its proxies give it a global reach, which would be even more alarming should Tehran divert WMD to these groups. This report attempts to explain to the American people that, although intelligence is inadequate to develop a thorough understanding of the threat posed by Iranian activities, there is sufficient information available to conclude that Iran poses a serious threat to U.S. national security and to the security of our friends and allies. Based only on unclassified material, it is reasonable to assume that Iran has a program to produce nuclear weapons. The United States needs better intelligence to assess the status of Iran's nuclear program and how soon it will have an operational nuclear weapon. Iran's misleading reports to the IAEA about its nuclear research activities, many of which violate its treaty agreements, suggest hostile intentions. Iran's missile programs provide Tehran with the ability to strike targets far beyond its borders, as do its support of terrorism and meddling in Iraq Moreover, the IAEA's belief that the Iranians may be testing missile reentry vehicles with nuclear applications poses the real possibility that Iran could spark a major regional war. The July/August 2006 Hezbollah attacks against Israel sparked an outbreak of violence with major ramifications for peace in the Middle East. These attacks may be fully backed by Tehran and could mark the beginning of a new and more dangerous policy by Iran to use a terrorist proxy to inflict pain on Israel and the West. The U.S. Intelligence Community will play an important role in assisting American policymakers in ascertaining the extent and objectives of any Iranian role in the Hezbollah attacks. The worst-case scenario is that Iran is run by a government into which we have little insight, and that this government is determined to acquire nuclear, chemical and biological weapons, support terrorism, and undermine political stability in Iraq. However, before we can conclude that this worst-case scenario is the reality faced by the United States, the Intelligence Community must provide policymakers with better insights into developments inside Iran. The U.S. Intelligence Community will play a pivotal role before, during, an after any negotiations with Iran. Iran's August 22, 2006 response to the nuclear incentives package will need a thorough and complete evaluation. Policymakers will need high quality intelligence to assess Iranian intentions to prepare for any new round of negotiations on its nuclear program and for possible future discussions about the situation in Iraq. U.S. negotiators will need as complete an understanding as possible about the Iranian nuclear program, including its research facilities and its leaders' intentions. 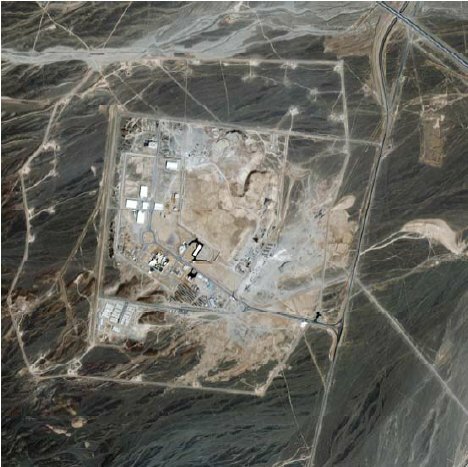 U.S. intelligence agencies will need to assess the likelihood of activities at undeclared nuclear facilities and how to verify Iranian compliance with a possible agreement on its nuclear program. If negotiations with Iran fail and a new set of trade sanctions are placed on Iran, the Intelligence Community will need to provide analysis and collection to verify international compliance with the sanctions. These and many other tasks will require a substantial commitment of collection and analytical resources by U.S. intelligence agencies. Improve analysis. The IC's analysis on vital national security issues like Iran must be thorough and timely. Analysts must evaluate all contingencies and consider out-of-the box assessments that challenge conventional wisdom. Iran WMD analysis could improve once the DNI Iran and Counterproliferation mission managers integrate analysts more thoroughly with collectors and with their colleagues in other agencies. Iran analysts must also make greater use of open source intelligence on Iran, the availability of which is augmented by Iran's prolific (if persecuted) press. Improve coordination on Iran-specific issues. To make effective use of the full range of tools and capabilities at its disposal, the Intelligence Community must ensure that each agency's efforts are fully coordinated and deconflicted. On the recommendation of the WMD Commission, the Director of National Intelligence established a Mission Manager for Iran to develop and implement a coordinated IC-wide strategy for Iran. This function, while still new, needs committed leadership and interagency cooperation to succeed. At a more operational level, individual agencies must ensure that their staffs - operators, analysts, targeters, and others - share information with each other and with their counterparts in other agencies to ensure that resources are allocated effectively and efforts are not duplicated by multiple agencies. The Mission Manager must focus in particular on filling the many intelligence gaps that prevent a thorough understanding and assessment of critical issues. Improve coordination on counterproliferation issues: The DNI has directed that the National Counterproliferation Center (NCPC), created by the Intelligence Reform and Terrorism Prevention Act of 2004, serve as the IC's Mission Manager for Counterproliferation. The NCPC can potentially play an important advisory role in improving proliferation analysis and collection. The NCPC and Iran Mission Manager must coordinate closely to ensure that they pursue consistent and complementary strategies on issues related to Iran's potential WMD programs. Furthermore, all IC experts should be called upon to bring their knowledge to bear on the problem. WMD experts at the Department of Energy National Labs, for example, should be more thoroughly integrated into the debates that take place inside the Beltway so others in the Intelligence Community can benefit from their in-depth expertise. Enhance HUMINT capabilities. 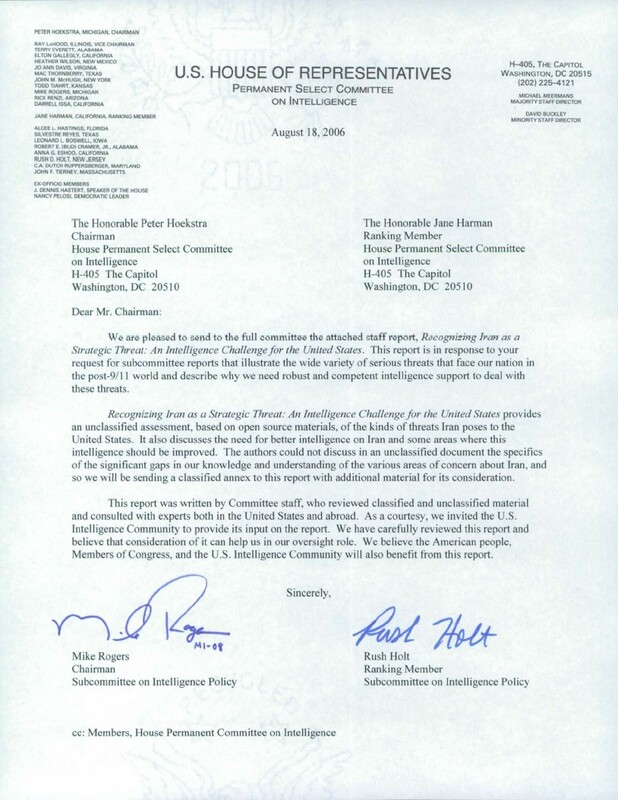 The DNI has recognized that the Intelligence Community needs to improve its human intelligence (HUMINT) capabilities writ large, both on foreign intelligence and counterintelligence matters. Certainly, the nature of the Iranian target poses unique HUMINT challenges; since American officials have so little physical access to Iran, it is difficult to collect information there. Strengthen counterintelligence efforts. We must assume that Iran attempts to collect intelligence on U.S. Government plans, strategies, and capabilities, as well as on sensitive technologies. The Intelligence Community must ensure that comprehensive counterintelligence training is given to professionals throughout the national security and scientific communities, both inside government and out, who are likely to be targeted by Iranian intelligence collectors. Define goals and develop metrics. The DNI must clearly identify his goals for improving Iran-related collection and analysis so members of the Community know what they are supposed to achieve. He must also promulgate detailed performance metrics so Community managers can assess, on an ongoing basis, whether they are improving capabilities and making progress toward their critical intelligence objectives. The DNI should share these objectives and metrics with it so the legislative branch can conduct meaningful, continuous oversight of its activities regarding this critical national security challenge. 1 Remarks by Iranian President Mahmoud Ahmadinejad during a meeting with protesting students at the Iranian Interior Ministry, October 25, 2005. 2 Iranian President Mahmoud Ahmadinejad in a speech given in southeastern Iran, December 14, 2005. 3 Comments by Iranian President Mahmoud Ahmadinejad during a nationally televised ceremony, April 11, 2006. 5 Director of National Intelligence John D. Negroponte, "Annual Threat Assessment of the Director of National Intelligence," Testimony to the Senate Select Committee on Intelligence, February 2, 2006. 6 Interview of Director of National Intelligence John D. Negroponte with James Naughtie of the BBC, 2 June 2006. Available at http://www.dni.gov/interviews/20060602_interview.htm. 7 U.S. Department of State, Adherence and Compliance with Arms Control, Nonproliferation, and Disarmament Agreements, August 2005, pp. 55-56. 8 U.S. Department of State, Adherence and Compliance with Arms Control, Nonproliferation, and Disarmament Agreements, August 2005, pp. 20-21. 9 Director of National Intelligence John D. Negroponte, "Annual Threat Assessment of the Director of National Intelligence," Testimony to the Senate Select Committee on Intelligence, February 2, 2006. 10 Cited in Ray Takeyh, testimony before the Senate Committee on Foreign Relations, 2 March 2006. 11 A complete set of IAEA documentation on the Iranian nuclear program is available on the IAEA website at http://www.iaea.org/NewsCenter/Focus/IaeaIran/index.shtml. 12 IAEA Board of Governors Resolution, September 24, 2005, GOV/2005/77, http://www.iaea.org/Publications/Documents/Board/2005/gov2005-77.pdf. 13 IAEA Board of Governors document GOV/2006/14, February 4, 2006. 14 UN Security Council Presidential Statement, March 29, 2006, S/PRST/2006/15. 16 Commission on the Intelligence Capabilities of the United States Regarding Weapons of Mass Destruction ("The WMD Commission"), Report to the President of the United States, 31 March 2005, page 4. 17 U.S. Department of State, Adherence and Compliance with Arms Control, Nonproliferation, and Disarmament Agreements, August 2005, p.77. 18 "Implementation of the NPT Safeguards Agreement in the Islamic Republic of Iran: Report by the Director General." International Atomic Energy Agency, Vienna, Austria, GOV/2004/11, February 24, 2004, p. 8; CNN.COM, March 10, 2005, http://www.cnn.com/2005/WORLD/asiapcf/03/10/pakistan.iran/index.html: CNN.COM, February 5, 2004, http://www.cnn.com/2004/WORLD/asiapcf/02/05/pakistan.nuclear/index.html. 19 Michael Laufer, "A.Q. Khan Chronology, Proliferation Brief, Volume 8, Number 8, Carnegie Endowment, 2006, http://www.carnegieendowment.org/publications/index.cfm?fa=view&id=17420. 20 "Implementation of the NPT Safeguards Agreement in the Islamic Republic of Iran: Report by the Director General." International Atomic Energy Agency, Vienna, Austria, GOV/2006/15, February 27, 2006, p. 15. 21 Reuters via DefenseNews.com, April 11, 2006, http://www.defensenews.com/story.php?F=1681098&C=mideast. 22 "Implementation of the NPT Safeguards Agreement in the Islamic Republic of Iran: Report by the Director General." International Atomic Energy Agency, Vienna, Austria, GOV/2003/75, November 10, 2003, p. 5. 23 "Implementation of the NPT Safeguards Agreement in the Islamic Republic of Iran: Report by the Director General." International Atomic Energy Agency, Vienna, Austria, GOV/2005/87, November 18, 2005, p. 2. 24 "Implementation of the NPT Safeguards Agreement in the Islamic Republic of Iran: Report by the Director General." International Atomic Energy Agency, Vienna, Austria, GOV/2006/15, February 27, 2006, p. 8. 27 "Implementation of the NPT Safeguards Agreement in the Islamic Republic of Iran: Report by the Director General." International Atomic Energy Agency, Vienna, Austria, GOV/2004/83, November 15, 2004, p. 19. 28 Iranian Atomic Energy Organization deputy director Mohammad Saeedi, April 11, 2006, http://www.guardian.co.uk/worldlatest/story/0,,-5751093,00.html. 29 "Fresh" unused fuel rods for light water reactors contain low enriched uranium pellets. An enrichment process exploiting these pellets would be much less time consuming than using unenriched UF6. The process would involve fluoridating the pellets, which would turn them into a gas, and then introducing this gas into centrifuges to enrich to weapons grade. 30 These estimates rely on experts consulted by committee staff and illustrate a reasonable theoretical timeline for producing sufficient fissile material for a nuclear weapon. Since the technical characteristics of Iran's nascent centrifuge program and its breakdown rate are unknown, the estimates for Iran's enrichment program could vary. Moreover, altering the numerous assumptions behind these calculations used could result in shorter or longer estimates. 31 "Implementation of the NPT Safeguards Agreement in the Islamic Republic of Iran: Report by the Director General." International Atomic Energy Agency, Vienna, Austria, GOV/2004/11, February 24, 2004, p. 8. 32 "Implementation of the NPT Safeguards Agreement in the Islamic Republic of Iran: Report by the Director General." International Atomic Energy Agency, Vienna, Austria, GOV/2006/15, February 27, 2006, p. 4. 33 John R. Bolton, "Preventing Iran from Acquiring Nuclear Weapons." Remarks to the Hudson Institute, Washington, DC, August 17, 2004. 34 Thomas Wood, Matthew Milazzo, Barbara Reichmuth, and Jeff Bewdell, The Economics of Energy Independence for Iran, Los Alamos National Laboratory and Pacific Northwest National Laboratory, U.S. Department of Energy, March 2006. 37 "Implementation of the NPT Safeguards Agreement in the Islamic Republic of Iran: Report by the Director General." International Atomic Energy Agency, Vienna, Austria, GOV/2003/75, November 10, 2003, p. 10. 39 Director of National Intelligence John D. Negroponte, "Annual Threat Assessment of the Director of National Intelligence," Testimony to the Senate Select Committee on Intelligence, February 2, 2006. 40 U.S. Department of State, Adherence and Compliance with Arms Control, Nonproliferation, and Disarmament Agreements, August 2005, pp.55-56. 41 Unclassified Report to Congress on the Acquisition of Technology Relating to Weapons of Mass Destruction and Advanced Conventional Munitions, 1 July Through 31 December 2003, November 2004. 42 U.S. Department of State, Adherence and Compliance with Arms Control, Nonproliferation, and Disarmament Agreements, August 2005, pp.55-56. 43 Unclassified Report to Congress on the Acquisition of Technology Relating to Weapons of Mass Destruction and Advanced Conventional Munitions, 1 July Through 31 December 2003, November 2004. 44 U.S. Department of State, Adherence and Compliance with Arms Control, Nonproliferation, and Disarmament Agreements, August 2005, pp.20-21. 45 FoxNews.com, October 5, 2004, http://www.foxnews.com/story/0,2933,134550,00.html. 46 "Missile Survey: Ballistic and Cruise Missiles of Foreign Countries." Congressional Research Service Report RL30427, March 5, 2004, p.17. 47 Unclassified Report to Congress on the Acquisition of Technology Relating to Weapons of Mass Destruction and Advanced Conventional Munitions, 1 July Through 31 December 2003, November 2004. 48 Director of National Intelligence John D. Negroponte, "Annual Threat Assessment of the Director of National Intelligence," Testimony to the Senate Select Committee on Intelligence, 2 February 2006. 49 "Implementation of the NPT Safeguards Agreement in the Islamic Republic of Iran: Report by the Director General." International Atomic Energy Agency, Vienna, Austria, GOV/2006/15, February 27, 2006, p. 8. 50 General John Abizaid, Commander, U.S. Central Command, "2006 Posture of the United States Central Command," Testimony before the Senate Armed Services Committee, 14 March 2006. 52 See FBI Indictment on Khobar Towers bombing, June 21, 2001, available at http://www.fbi.gov/pressrel/pressrel01/khobar.pdf. 53 Vice Admiral Lowell E. Jacoby, USN, Director, Defense Intelligence Agency, "Current and Projected National Security Threats to the United States," Testimony to the Senate Select Committee on Intelligence, 16 February 2005. 54 Daniel Byman, "Iran, Terrorism, and Weapons of Mass Destruction," Testimony before the House Homeland Security Committee, Subcommittee on the Prevention of Nuclear and Biological Attacks, 8 September 2005. 55 BBC News website, Friday, 17 March 2006. 56 Jonathan Finer and Ellen Knickmeyer, "Envoy Accuses Iran of Duplicity on Iraq," Washington Post, March 24, 2006, page A12. 57 Director of National Intelligence John D. Negroponte, "Annual Threat Assessment of the Director of National Intelligence," Testimony to the Senate Select Committee on Intelligence, 2 February 2006; Nicholas Burns, Under Secretary of State for Political Affairs, "United States Policy Toward Iran," Testimony before the House International Relations Committee, 8 March 2006; Scarborough, Rowan. "Rumsfeld Says Iran 'Allowing' Weapons Into Iraq." Washington Times, August 10, 2005. 58 Lionel Beehner, "Background Q&A: Iraq Militia Groups," Council on Foreign Relations, available at http://www.cfr.org/publication/8175/#6. 59 General George Casey, quoted in Tom Lasseter, "Iran Gaining Influence, Power in Iraq Through Militia," Knight- Ridder Newspapers, 12 December 2005. 60 Tom Lasseter, "Iran Gaining Influence, Power in Iraq Through Militia," Knight-Ridder Newspapers, 12 December 2005. 61 Edward T. Pound, "Special Report: The Iran Connection," U.S. News & World Report, 22 November 2004. 62 Kenneth Katzman, "Iran's Influence in Iraq," Congressional Research Service Report RS22323, 30 November 2005. 63 Lionel Beehner, "Background Q&A: Iraq Militia Groups," Council on Foreign Relations, available at http://www.cfr.org/publication/8175/#6. 64 President George W. Bush, speech to the Foundation for the Defense of Democracies, George Washington University, Washington DC, 13 March 2006. 65 John Negroponte, Annual Threat Assessment of the Director of National Intelligence for the Senate Select Committee on Intelligence, February 2, 2006, p. 13. 67 U.S. Department of State, Country Reports on Terrorism 2004, April 2005, pp. 88-89. 68 Secretary of State Condoleezza Rice, Roundtable With Australian, Indonesian and Latin American Journalists, 9 March 2006, available at http://www.state.gov/secretary/rm/2006/62968.htm. 69 State Department Coordinator for Counterterrorism Henry Crumpton, quoted in Dana Priest, "Attacking Iran May Trigger Terrorism," Washington Post, 2 April 2006, p. A1. 70 Paula DeSutter, Assistant Secretary of State for Verification and Compliance, Testimony before the U.S.-Israel Joint Parliamentary Committee, 17 September 2003. 72 Robin Wright, "Most of Iran's Troops in Lebanon Are Out, Western Officials Say," Washington Post, 13 April 2005, page A10. Also Kenneth Katzman, "Iran: U.S. Concerns and Policy Responses," Congressional Research Service Report RL32048, 20 March 2006, p. 21. 73 U.S. Department of State, Country Reports on Terrorism 2004, April 2005, pp. 89. 74 Jerusalem Post, August 13, 2006, http://www.jpost.com/servlet/Satellite?c=JPArticle&cid=1154525862648&pagename=JPost%2FJPArticle%2FShowFul l; STRAFOR.com, August 14, 2006, http://www.stratfor.com/products/premium/read_article.php?id=272526. 75 U.S. Department of State, Patterns of Global Terrorism 2002, 30 April 2003. Also Ari Fleischer, White House Press Briefing, 25 March 2002. Also, regarding Hezbollah as a source of funding for the Karine-A shipment, see "Iran and Syria as Strategic Support for Palestinian Terrorism," Israel Ministry of Foreign Affairs, 30 September 2002, available at http://www.mfa.gov.il/MFA/MFAArchive/2000_2009/2002/9/. 76 U.S. Department of State, Country Reports on Terrorism 2004, April 2005, pp. 89. 77 Associated Press, "Iran Promises Hamas $250 Million in Aid," Ha'aretz, 28 February 2006. 78 Matthew A. Levitt, "Sponsoring Terrorism: Syria and Islamic Jihad," Middle East Intelligence Bulletin, November- December 2002, available at http://www.meib.org/articles/0211_s1.htm. 79 Amos Harel, "Iran urging Islamic Jihad to attack Israel ahead of election," Ha'aretz, 13 March 2006. 80 Octavia Nasr, "Tape: Bin Laden Tells Sunnis to Fight Shiites in Iraq," CNN.com, 1 July 2006. available at http://www.cnn.com/2006/WORLD/meast/07/01/binladen.message/index.html. 81 R. Nicholas Burns, "U.S. Policy Toward Iran," Speech at Johns Hopkins University Paul H. Nitze School of Advanced International Studies, Washington, DC, 30 November 2005. 82 Secretary of Defense Donald Rumsfeld, quoted in Associated Press, "US: Iran Gives Al-Qaeda Safe Passage," 3 April 2002. 83 Nicholas Burns, Under Secretary of State for Political Affairs, "United States Policy Toward Iran," Testimony before the House International Relations Committee, 8 March 2006. 85 Country Reports on Terrorism 2005, U.S Department of State, Publication 11324, April 2006, p. 173. 86 Anthony Cordesman and Khalid Al-Rodhan, Iranian Nuclear Weapons? The Threats from Iran's WMD and Missile Programs (Working Draft) (Washington: Center for Strategic and International Studies, 21 Feb 2006), p. 44. 87 Daniel Byman, "Iran, Terrorism, and Weapons of Mass Destruction," Testimony to the House Homeland Security Committee, Subcommittee on the Prevention of Nuclear and Biological Attacks, 8 September 2005, citing Kenneth Pollack, The Persian Puzzle (New York: Random House, 2004), pp. 420-421. 88 General John Abizaid, Commander, U.S. Central Command, "2006 Posture of the United States Central Command," Testimony before the Senate Armed Services Committee, 14 March 2006.